I can’t recommend June’s classes enough! She has a wealth of knowledge that she is keen to share and I’ve no doubt that everyone leaves her classes with, at the very least, new tools that can be applied to life, not just childbirth. June takes a really positive approach to birth, and why shouldn’t she, we are after all designed to do this. I feel everyone could benefit from this approach. Recognising what your body is doing at each stage is a vital part of being able to control how we feel and apply the techniques learnt. It may not always go to plan but the hypnobirthing mindset will always be there to remind you you’ve got this 👍🏻 The course is worth every penny and I would encourage anyone to give it a go. After a fairly traumatic first labour nine years previously I wanted to try something completely different. I freely admit that I was sceptical, but all I can say is that it made for a truly incredible birth experience. I did hypnobirthing with with babies #2 and #3 and for both had a totally drug free, gentle birth into water. I felt totally in control, especially the second time around, and the entire !experience was so magical that I’m almost tempted to have another baby just so I could experience it all over again. It is empowering, it gives the birthing partner a defined, important role, it allows you to prepare mentally and physically for one of the most amazing experiences of your life. I can not recommend June highly enough either; she is so warm and comforting and even came to our baby’s first and second birthday parties! She is very experienced and I felt incredibly safe and supported throughout the entire process. The small groups are fabulous and I am still in contact with everyone in mine nearly six years on. I simply cannot recommend June and hypnobirthing highly enough. Our Hypnobirthing experience was fantastic thanks to June and her course. She explained in detail each and every stage of labour and the techniques we could use to manage them. Throughout my labour, I was in control and there were no nasty surprises thanks to the positive expectations, breathing techniques and depth of knowledge we had gained from June’s course. I would definitely recommend! I did the course with June for both my babies and cannot recommend it enough. June is an exceptional teacher and both myself and my husband came away with a wealth of knowledge and more confidence about the birth. Don’t hesitate to do this course, it’s amazing and worth every penny. The hypnobirthing classes helped me feel totally relaxed and confident in the lead up to the birth of my first baby. I have now had two little boys using hypnobirthing and with both of them my birthing experience was fantastic, no pain killers (not even paracetamol) and just lovely relaxed and controlled labours. I always recommend hypnobirthing to all my expectant friends. Well – Evie Belle arrived on 6th November at home!! Another natural birth, another quick one of 1hour 18minutes!!!! I cannot begin to thank you enough for teaching us Hypno birthing. Each birth has been different, each one amazing, and I feel so privileged to have been taught the tools to bring each baby into the world naturally and to remember each birth with such clarity. I love the fact that what you teach brings us back to the power of womanhood, back to the strength and capability we all have within us to bring our children into the world naturally. 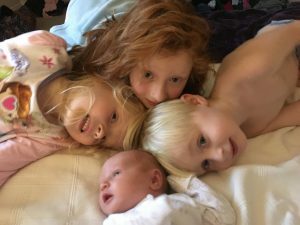 Our family feels complete now with Evie and all three of the ‘older’ children have been able to see that birth is not to be feared, but something that can happen safely within your own home and be enjoyed. I’ve attached a photo of all your Hypno birthed Wallace’s! And if you ever want us to chat to any parents to be etc we’d be only too delighted to! Once I was pregnant I knew deep down I was capable of a pain-free natural birth and HypnoBirthing unlocked that capability. The birth of my baby was beautiful, intimate and everything my husband and I had dreamed of. I would not have changed a thing about how she entered the world. She is beautiful, calm, happy and gentle. I recovered quickly as well, knowing my labour had been a natural event not an “illness”. My birth was just as I hoped it would be. I felt minor contractions building but was able to remain calm, bath and get an hours sleep before I was woken up by intense, regular contractions. I was astonished to feel the excitement and even laughed through some of them as I couldn’t wait to meet our baby. I had thought I would be frightened as my labour with my first child had been incredibly hard. HypnoBirthing kept me calm and gave me a whole new perspective on birthing. My husband said my ability to go inwards during a contraction and cope without pain relief was amazing to see. I had a wonderful birthing experience. Our HypnoBirthing course very much put us at ease of the whole idea of delivering our baby and gave us confidence and reassurance that we would have a lovely experience. Rather than feeling any nervousness we were extremely excited at the thought of childbirth as rather than have any negative thoughts we concentrated on meeting our baby. It enabled us as a couple to work together with very little intervention from our midwife or anyone else during our birth. So thankful we took the HypnoBirthing classes. 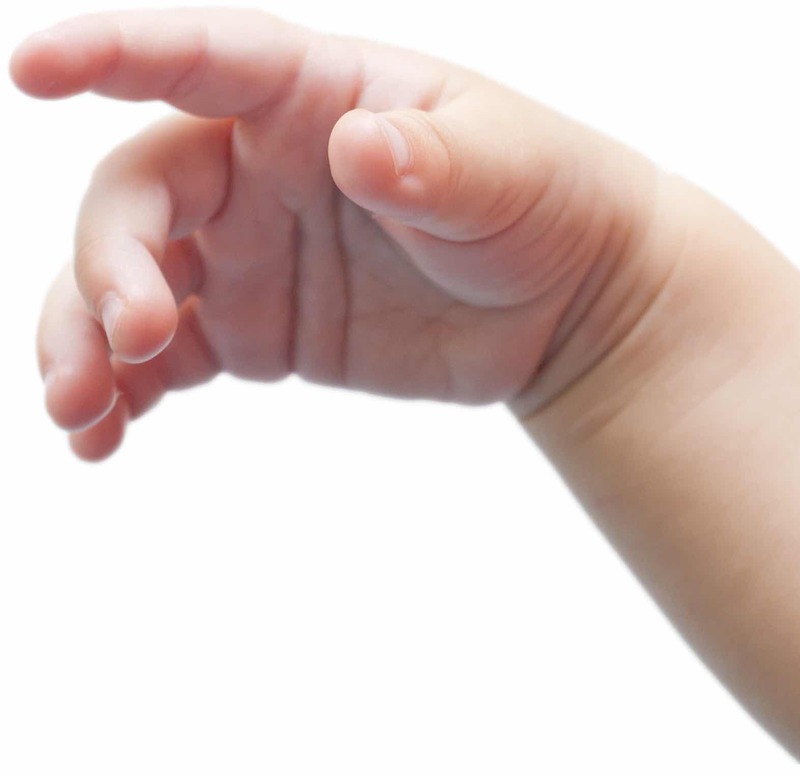 Believe it really changed the course of things – our baby is easy-going and content and healthy and I believe much of it has to do with the natural way he was brought into the world HypnoBirthing techniques kept me calm and in control and I am planning on using them for subsequent children. Thank you! As I had been having intense surges every 5-8 minutes for 24 hours before active labour, I found it difficult to control my breathing in the last half hour before transition and used the gas and air to allow me to breathe properly – in that time I went from 4-5cms dilated to ready to “push”. I loved breathing the baby down using J breathing – It worked so well, it only took 36 minutes and Harry popped out all in one breath! I found using the birthing ball useful and the birthing pool help me to dilate from 2 1/2 cm to 10 cm in 2 1/2 hours unfortunately due to the baby being in posterior position I found it difficult to feel comfortable but kept going with my breathing anyway. Once active labour kicked in it was a very speedy process I did lose my HypnoBirthing mindset temporarily but my partner helped to ground me again. I found all of the breathing techniques particularly helpful. Although I did not have a natural birth and had to have a C section I still used HypnoBirthing techniques during surges. I listened to music and concentrated on breathing correctly. I felt relaxed at all times. I did become upset and frustrated when I knew a natural birth was not possible, however thanks to staff and my husband I relaxed myself again and stayed calm throughout. HypnoBirthing made me feel in control and confident enough to question and make informed decisions during the labour. It was easy to “centre” during a contraction and allowed me to remain calm and interact with midwives and partner during the whole labour. I also vowed I’d never give birth in the old “stirrup”position, but it was the best position for me in the end and I feel the HypnoBirthing course help me to be open-minded to how the labour progressed. My contractions were very erratic to begin with but through using the breathing and relaxation techniques I found I was quite comfortable throughout the early stages. My contractions started on the Saturday evening but I was still able to sleep most of the night by being very relaxed. Throughout Sunday whilst the contractions became stronger I relied heavily on the breathing whilst I found moving around made the contractions much easier. We arrived at the hospital at 1 am Monday morning and again I found keeping active helped me a lot along with the focused breathing. When things weren’t progressing very quickly I agreed to have my waters broken, every thing became much more intense, but I found it easier to cope with as I had retained my energy earlier by being very relaxed. Within one hour and 40 minutes from my waters being broken our son was born. I used gas and air for the last hour or so, but I found it helped most by remaining focused on my breathing. When my husband Charlie and I booked the course during our first pregnancy we weren’t really sure what to expect! However we benefited in numerous ways and would highly recommend HypnoBirthing … Firstly because June is a qualified midwife we gained a much better general understanding of what to expect during birthing and this helped to remove any preconceptions and fears. We found that although the practicing did require a time commitment it was actually a good way of relaxing during the pregnancy. It also meant my husband felt much more involved in the experience as the techniques required practice and gave us time to focus on our new baby together. When the time came, our baby did have to be artificially induced. However we were still able to use the HypnoBirthing techniques and as a result had the positive delivery of birth that we had anticipated – and a lovely baby boy. Thank you so much for enabling us to bring Edward into the world in the lovely way we did, we would gladly talk to any couples who need advice if that may help. We thoroughly enjoyed the course; I personally got so much out of it and feel that I am well prepared and confident about the birth of our baby. I came to the course with many fears of birthing and left with none and I am actually looking forward to the experience. The course really helped me to address my fears of labour and birth and to stay calm, relaxed and focused. Thank you for bringing this course to Jersey; my birth wasn’t without it’s complications in the end; however the practice and techniques we had learned enabled us to have a calm labour. We are certain that Annabelle is a calm and contented baby as a result. Nobody could believe how laid back I was leading up to the birth; I felt so serene! During labour I relaxed in the bath for around 2-3hours whilst listening to the rainbow relaxation CD and my husband poured water over my abdomen and prompted me to breath correctly. I was dreading leaving the bath to go to hospital in the car but did so when surges were less than 3 minutes apart. I put the CD on in the car and closed my eyes. It turned out that the car journey was when I went deeply within myself. I arrived at the hospital in a trance-like state which I remained in for most of the remainder of the labour. My husband and midwife thought I was asleep at times but I was able to interact with them when I chose to. Whenever I started to come out of relaxation I was aware of the discomfort of the stronger surges, which was a great incentive to relax again! I was able to give birth to my little girl with no pain relief (although Ventouse Suction was required) and had a wonderfully alert and “chilled” baby. There really need not be anything to fear from giving birth other than fear itself. Thanks for teaching us how to HypnoBirth – it was truly an amazing experience, that’s given Cloy the best start in this life. We both feel we have learnt a life skill in relaxation techniques which will prove useful in the future. Thank you so much for HypnoBirthing, whilst the birth didn’t fully go as planned, we approached it and dealt with it with confidence and the end result is a beautiful, relaxed son “Thomas” who brings us so much joy and love every day. A very big thank you for the HypnoBirthing techniques, they made all the difference in bringing our wonderful daughter into the world in the most natural way possible. Not only did I have a wonderfully relaxing pregnancy thanks to all those relaxation exercises but we both felt full of confidence for Olivia’s birth. Richard and I both felt that we were in total control of our care thanks to all the knowledge you gave us. It was a wonderful, relaxing experience and really allowed me to relax from pregnancy to birth as well as helping my partner to feel a part of the birth. Our baby is very placid and relaxed and we believe this is due to her panic and stress-free birth. Having had an emergency caesarean section with my first baby (Henry), I was eager to attempt a natural delivery with my second. The breathing techniques used in HypnoBirthing taught me a deep relaxation which enabled me to work with my body rather than against it. I felt totally in control. It was an amazing experience when, following a birthing of controlled breathing and tranquil music, my second baby (Isabelle) was born naturally. My husband and I approached the workshop with an open mind hoping to glean anything that would help make this double birth the natural and joyous event we wanted it to be. We weren’t’t disappointed. Through self-hypnosis and breathing techniques we were shown how to re-attune our minds and bodies to more positive ways of thinking about childbirth. In fact, I was amazed at the relaxed state I was able to achieve by visualisation and ‘just breathing’. Armed with these tools I was already feeling better prepared, more relaxed and in control alongside my husband who was able to take an active part in preparing for the births of our babies. Looking back on the safe arrival of our beautiful baby boys and our hypnobirth experience, I feel a real sense of joy and wonderment. I was prepared, ready to trust my body and embrace my natural birthing instincts. It felt right. I was totally calm and felt a natural anaesthesia flow through me, taking me to a totally new level of relaxation. There was no pain. What a more rewarding and in-control experience childbirth was for me using HypnoBirthing. I am sure that with greater awareness of the techniques many more women could benefit as I did. My first pregnancy resulted in an emergency caesarean section and when I fell pregnant again, I was determined to have a natural delivery. HypnoBirthing gave me the birthing experience that I truly wanted. The techniques that I learnt gave me the confidence to remain in control of my labour. I cannot recommend it highly enough; giving birth naturally and without intervention was a truly wonderful experience. I am delighted to have taken part in this method of birthing, already I feel that he is a happy and contented baby whom I feel is mainly due to the natural birthing he had. The course and the experience have also brought my husband and I closer as we have shared the birthing experience together. Pregnant with my second son, I was very interested but extremely sceptical about the practical results that could be obtained from the HypnoBirthing technique. As a result I was genuinely astonished and delighted that by using what I learnt on the course, I had a calm, gentle, focused labour, and gave birth quickly and without pain relief – not what I’d expected at all! I recovered very quickly and feel great. June Poole is an inspirational teacher and I wouldn’t hesitate to recommend the course.